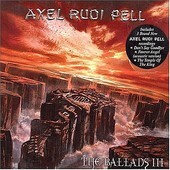 Hard rockin' German axeman Axel Rudi Pell has put out his third installment of ballads on the appropriately titled THE BALLADS III. This 11-track collection sounds like 1988 all over again, so much so that the only thing missing is a can of Aqua Net and some fringed leather jackets. However, fans of the beleaguered but ultimately memorable entity known as the power ballad will rejoice over this collection. Compiling the softer side of Pell's last three releases with three new cuts, one of which being a soulful cover of Rainbow's "The Temple of the King", THE BALLADS III may not be an essential purchase. But, if you're a fan with a completist complex or are a little curious on how little the power ballad has changed over the last 20 years, this CD is for you.